British Airways new Heathrow Terminal 5 is working online at today’s Site of the Day, www.terminal5.ba.com/yesterday. The new terminal was opened in March 2008 and soon became known for long queues, cancelled flights and missing luggage. Clearly the airline had moved too quickly, overlooking the level of detail required to make the new facility work smoothly. 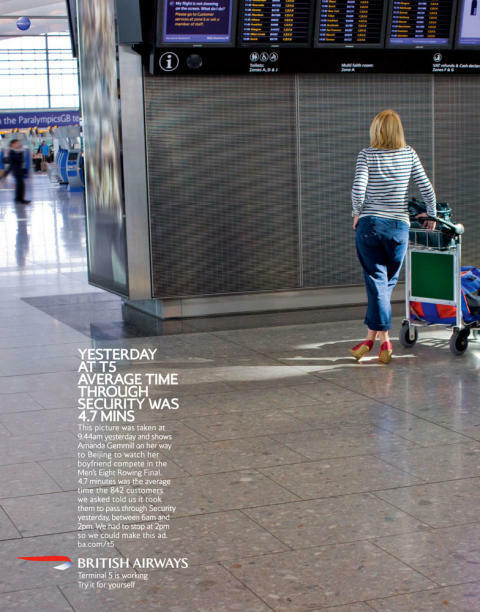 In August BA launched “Terminal 5 is Working”, a site featuring daily statistics and customer perspectives. Real customers are photographed during their journey through T5. The campaign was developed at BBH, London, by creative director Mick Mahoney and creative team Brad Woolf, Dan Bailey and Pedro Alvarez. A series of seven press advertisements from the campaign were named best newspaper ad of the month in the Newspaper Marketing Agency ANNAs, nominated by ANNAs judge Nik Studzinski, creative director at ad agency Mother.